In Germany and around the world, the last residence of persecuted Jews and other victims of Nazi terror are marked by small brass bricks called Stolpersteine – Stumbling Stones. There are more than 70,000 of these 10 by 10 cm stones installed in cobblestoned and paved sidewalks all made by hand by the artist Gunter Demnig who began the project back in 1992. It has now become common for many in Germany to mark the 9th of November – the anniversary of Kristallnacht – and the 27th of January – Holocaust Remembrance Day on the anniversary of the Red Army’s liberation of Auschwitz – by polishing local Stolpersteine. While the Stolpersteine are ubiquitous across Germany, there are a few exceptions. The city of Munich banned the installation of new Stolpersteine in 2015 after claims that they were disrespectful of the dead, whose names were walked on by the living. In Erfurt, where I now work, the Stolpersteine are not banned, but instead the last known residence of Nazi victims is marked by a DenkNadel – a memorial needle. The civic group Erfurter GeDenken called for proposals in 2007 to create a uniquely Erfurt commemoration for the victims of Nazi terror and local artist Sophie Hollmann won the competition with her design: a silver cone topped by an orange ball as if it was a giant pushpin pressed into the street to mark the spot. The first set of DenkNadel were installed on November 9, 2009 with five more installed in the following years across the city. Yep. Definitely the Eastern part of Berlin. At the time I thought it was Soviet revolutionary Vladimir Lenin – graffiti covered the name as it does until the city cleans it off about six times a year. I quickly discovered that this was actually Ernst Thälmann, the leader of the German Communist Party in the Weimar Era. The massive Lenin statue that had once loomed over a square in neighbouring Friedrichshain had already been gone for 19 years at that point. In 1991, all 19 meters of red Ukrainian granite had been taken apart and buried in a forest on the outskirts of town. In post-reunification Berlin, what monuments stayed and which had to go has not always been consistent. Why did Thälmann survive and Lenin get tossed into the dustbin of history? Yes, Thälmann has a billowing flag adorned with the hammer and sickle, but he’s been spared because of a confluence of obscurity, expense and victimhood. While Lenin was situated in the middle of square and the centerpiece of a neighbourhood, Thälmann is tucked into an unpopular park surrounded by high-rise towers in a quiet part of Prenzlauer Berg. Unless you end up on the M4 tram taking a short-cut to Alexanderplatz, you don’t see him unless you are a local. Getting rid of that much bronze and marble won’t be cheap either. Dismantling Lenin cost the city over 100,000 DM in 1991 (around €50,000) and after that there was less enthusiasm for a full sweep of old monuments even from ardent anti-communists. The Lichtgrenze commemorating the 25th anniversary of the opening of the Berlin Wall- November 9, 2014. From our perspective today, it is easy to see November 9, 1989 as the end of the German Democratic Republic. In most of the coverage of the anniversaries, that date is synonymous with the fall of the Berlin Wall, the collapse of monopoly rule by the Socialist Unity Party (SED) and the end of the feared Ministry of State Security, the Stasi. In retrospect, it is clear that the opening of the Berlin Wall on November 9 was a decisive breaking point, after which the SED could never recover its capacity to rule. But on November 10, 1989, this was far from obvious for all involved. In the early hours that day it was still unclear what exactly had happened overnight. SED officials still believed they could re-impose controls on cross border travel. The Soviet Union had yet to comment on the events or indicate if it would intervene. While earlier mass protests had been tolerated, Egon Krenz, leader of the SED since late October when he had deposed Erich Honecker, had praised the violent crackdown at Tiananmen Square earlier in the year leading some to fear violence could still come. That the opening of the border would usher in a peaceful transition to pluralistic democracy and later reunification was hardly certain. 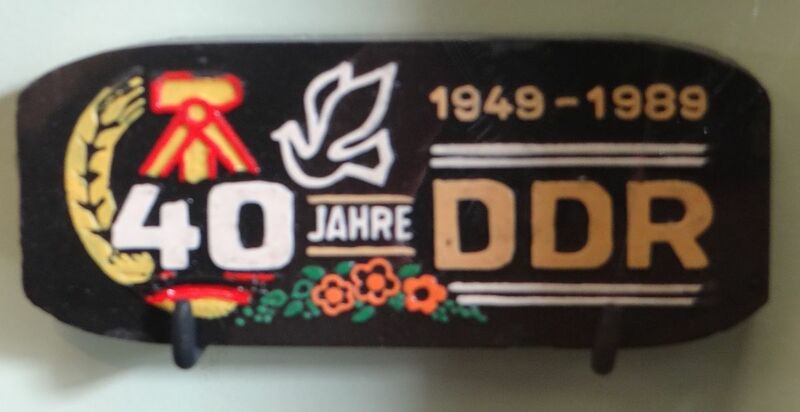 Had it survived the collapse of state socialism, the German Democratic Republic would be commemorating its 66th anniversary today. A month before the Berlin Wall came down in 1989, the GDR held a massive celebration for East Germany’s the 40th year as a separate country. By the next year, politicians from both East and West worked together to make sure the GDR ceased to exist on October 3rd, in part to avoid the awkwardness of reaching 41. Twenty-five years later, as the unified Germany dominates the political and economic landscape of Europe, alternatives to this status quo seem unthinkable. While the continued existence of the GDR has recently been the subject of no less that three speculative novels, contemplating such an idea is usually geared towards parody and humour. When we talk about German reunification, it is important to remember that the country created in 1990 looked very different than that sought as the division of the two Germanies was being formalized in 1949. 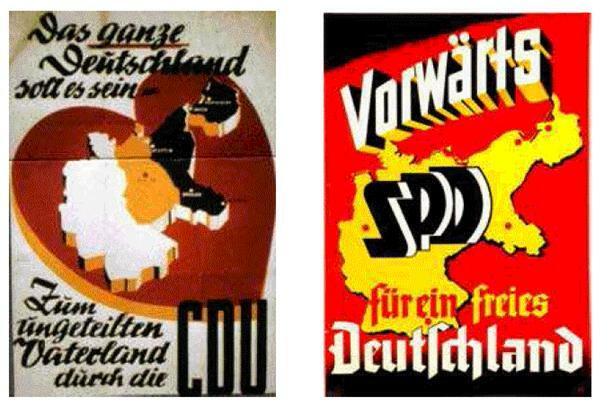 In Western political posters from that year, the Christian Democrats (CDU) and the Social Democrats (SPD) both clearly supported the return of all lost territory in the East including that annexed to Poland and the Soviet Union in 1945. 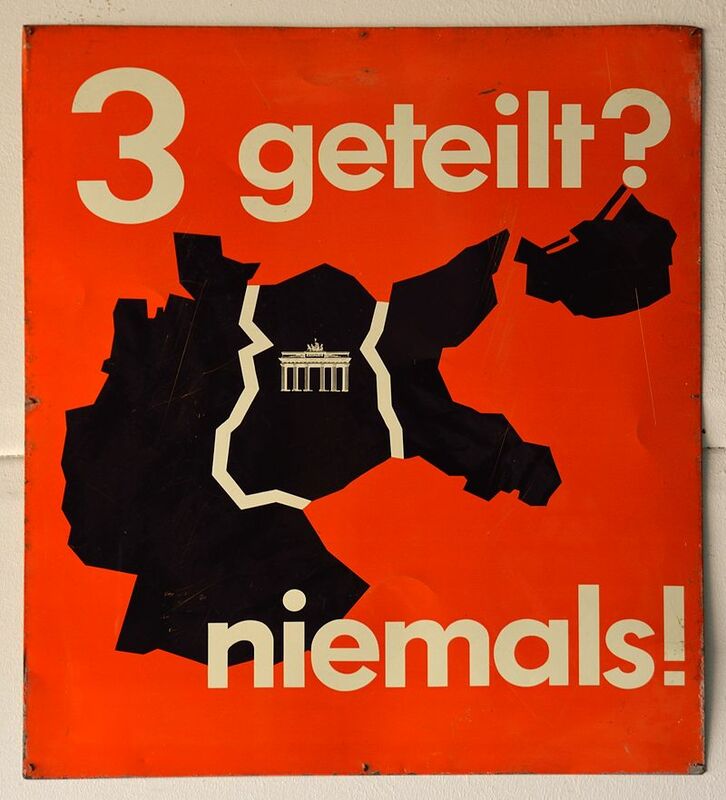 Into the 1960s, the Committee for an Indivisible Germany, a group supported by the West German left and right alike, produced propaganda material calling for the return return what was then the Western half of Poland as well as Kaliningrad. Divided in 3 – Never! By the 1980s, the idea that reunification would include lands beyond the Oder-Neisse line that separated the GDR from Poland had moved to the margins. 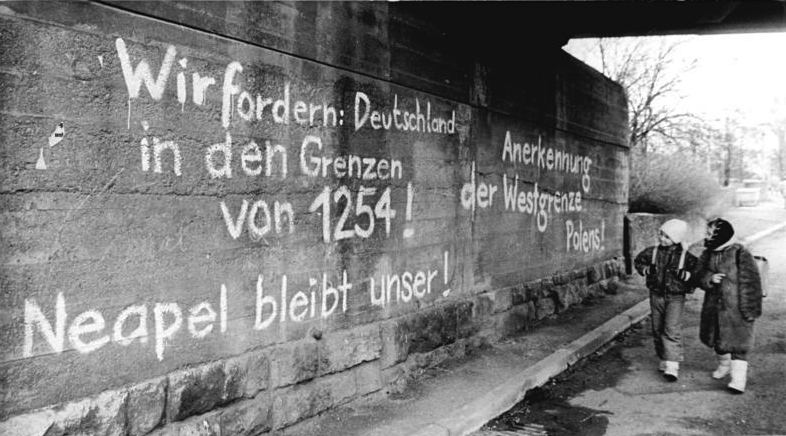 There was, however, enough discussion of the idea to inspire this graffiti in Jena mocking demands for a return to 1937 borders. 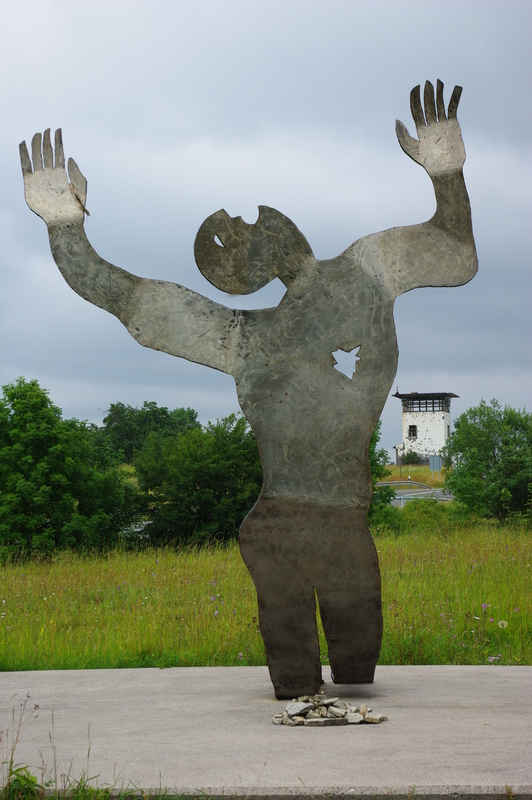 On August 24, 1961, Günter Litfin was shot to death by East German transport police as he tried to cross the border to West Berlin. A tailor from Weissensee, the 24-year-old Litfin had climbed over the Berlin Wall, built only 11 days earlier, near the Charité Hospital. Police fired warning shots at Litfin while he was on solid ground, but once he jumped into the Humboldt Harbour and began swimming for West Berlin, they took proper aim and hit their target. His corpse was pulled from the water a few hours later by East German firefighters. Early in the morning of February 6, 1989, Chris Gueffroy became the last person to be shot to death while crossing the Berlin Wall. The 20-year-old waiter decided to leave East Germany on the cusp of being conscripted into the National People’s Army. With his friend Christian Gaudian, Gueffroy hoped to cross the Britz Canal to the West Berlin district of Neukölln – they erroneously believed that the order to use deadly force at the border had been suspended. Border guards opened fire on the pair as they scaled the final layer of border fencing. Gueffroy was hit twice in the chest and died immediately. 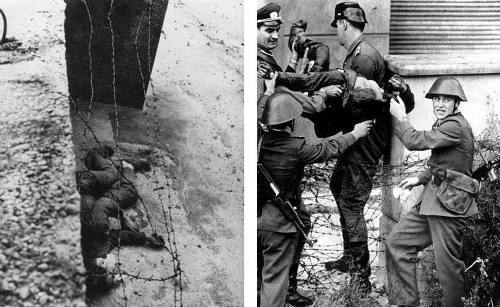 Litfin and Gueffroy are often mistakenly referred to as the first and last victims of the Berlin Wall, but this sad distinction actually belongs to two others. The 58-year-old widow Ida Siekmann died of injuries from jumping from a building on Bernauerstrasse to cross the Wall two days before Litfin was shot. At the other end, Winfried Freudenberg was killed over a month later than Gueffroy when his makeshift balloon failed during the border crossing and he fatally crashed in the West Berlin suburb of Zehlendorf. The death of Peter Fechter. East Berlin. August 17, 1962. 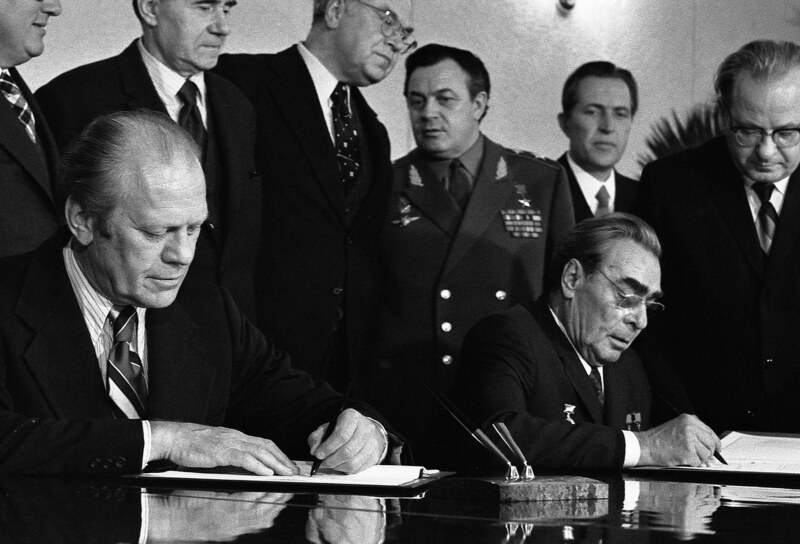 Forty years ago today, 35 countries from both sides of the Iron Curtain signed the Helsinki Accords – the final act of the Conference on Security and Co-operation in Europe. Since the end of the Cold War, this agreement has been held up as a crucial turning point in the modern history of human rights. Academic and journalistic accounts often cite the Helsinki Accords as a breakthrough moment when communist states in the Eastern Bloc first accepted the principles of human rights. It is, thus hailed as the inspiration for the wave of human rights activism that culminated with the revolutions of 1989. This fatal decision by the leaders of the Eastern Bloc to sign on to an agreement with significant human rights provisions has been explained as an act of hubris, cynicism or some combination thereof. According to these narratives, wily diplomacy on the part of the West pressured the leaders of the Soviet Union and its satellites to sign its own death warrant by agreeing to respect rights they were obviously violating. In the broader history of human rights in the Eastern Bloc, however, it becomes harder to draw a straight line of connection from the diplomacy of 1975 to the collapse of European state socialism in 1989/91. First, the Helsinki Accords were not the first instance in which communist states had recognized human rights. Second, while the human rights provisions of the Helsinki Accords were fiercely argued over, they were not simply imposed by the West on a recalcitrant East. Third, while the agreement provided fodder for dissidents, it was one of many human rights documents cited by activists rather than a singular catalyst for change.